The spinning wheel is its itself an exquisite piece of machinery. My head daily bows in reverence to its unknown inventor. 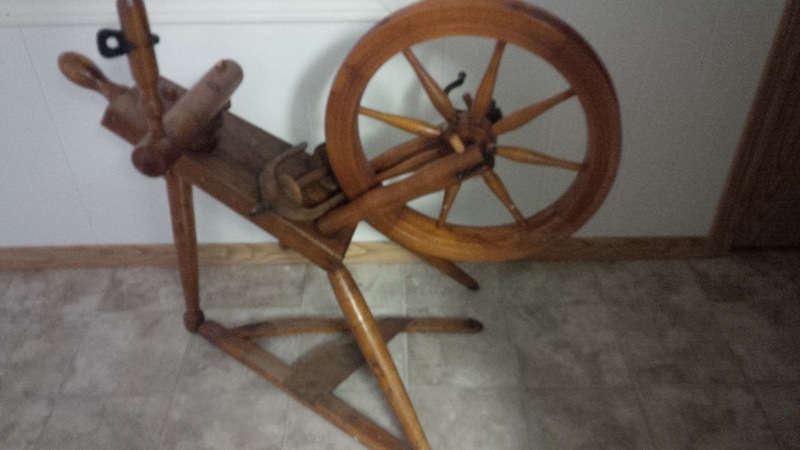 There are few Hutterites left who know how to use a spinning wheel. But back in the day, almost every household had one and it was being used. My mom tells me, since she was the oldest in the family, she started helping her mother with spinning as a young school girl. Back then, you didn't go to a store to buy wool; you simply spun your own. Later the wool was put in big skeins and dyed; then used to knit winter stockings and mittens. A few years ago we invited a Hutterite grandmother to our school. She's one of the few Hutterites who can still spin. She lives at a near-by colony and gladly came to demonstrate this lost skill. As her daft fingers worked at the wheel, our students stood round her, wide-eyed with wonder, watching the bundle of wool in her hands being spun into a spool of yarn. This was almost as magical as Rumpelstiltskin spinning straw into gold! To be sure, soft, warm wool was like gold for our grandparents; more so than it is today, when we can easily buy stockings, mittens and gloves. Really, how often to we stop to think, when we wear woolen items, where they come from (beyond store), how they're made? I know I never do. Today, if there's a spinning wheel left in a home, it's been relegated to collect dust in the basement or in the attic, or some other forgotten corner on the colony. A few years ago my sister, Elma rescued one such treasure from the basement of a friend. It now stands in the office of our house, in need of repair. When people see it, they're taken back in time, when things were much slower paced than today. When grandma would sit at the spinning wheel, humming to herself or telling stories to grandchildren, as she made sure there was wool around to keep the hands and feet of her family toasty warm. Do you have any spinning stories to share? 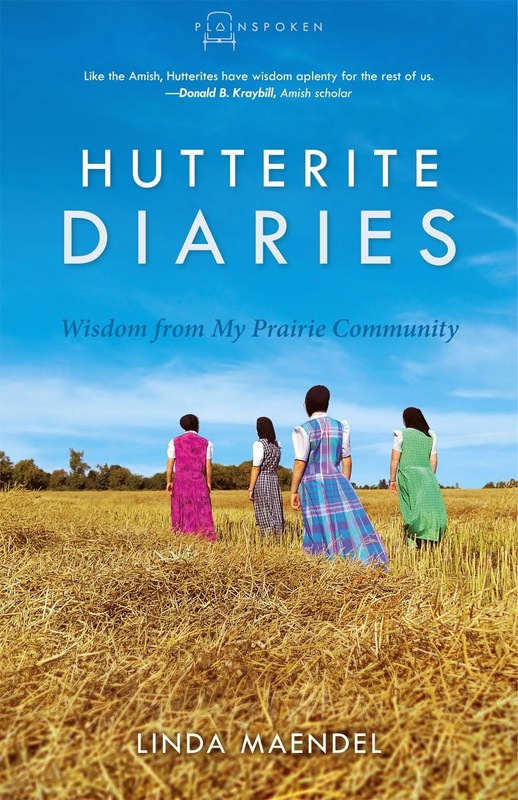 I was inspired to start a new blog series, Treasures of Yesteryear, when someone sent me a message through the blogger contact form, asking me about Hutterite antiques. If you can think of such items I could feature, please send me a message or leave a comment. Thanks! I have never spun wool, but I have washed, pulled and carded wool. There is something so relaxing about working with wool. It seems that way, Katie. My sister make dryer balls with wool, and just watching her sit and poke at a ball of wool with hooked needle is relaxing. I sleep with a wool comforter, and don't want any other. It's so soft and cosy. I learned to spin in Berkeley in the mid-seventies, first on a drop spindle and then on a wheel. I still have an Ashford wheel, which was the most common kit wheel at the time, though it's not in working order any more, and I don't really know how to get it there-- and don't have time to think about it at the moment. But I loved spinning. When I learned to spin my grandmother gave me her mother's spindles, made for her by my great-grandfather, I believe. She used to spin enough wool every year to knit him a couple of pairs of socks-- very very straight long staple wool that they brought with them when they came to this country. I still do not know exactly how these spindles were used-- my grandmother, who was basically a master of every needlecraft there is, did not know how to spin herself. They look like e.g. Egyptian drop spindles, with the whorl at the top, but a small one, with a very long shaft. My grandmother thought she somehow rolled them on her knee. I still have not been able to find out. I love that your own family can still remember people actually spinning. Wool is such an amazing and valuable fiber! Today there are so many synthetics to effectively keep us warm (some a lot more comfortable than wool, too) but it's hard to imagine people getting along without it before those other things were invented. I'm curious, did the people in your family/colony spin anything besides wool? Thanks for your interesting post. Rasqa. As far as I know, wool is the only thing that Hutterites ever spun. If I'm wrong on that, I'm hoping someone will correct me.